Outgoing postcard US -3223052 to Czech Republic shows the Theatre in Delphi, Greece. 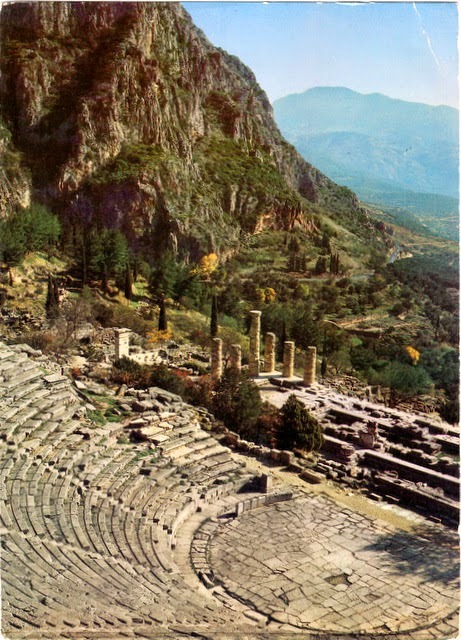 Located on the south-western spur of Mount Parnassus in the valley of Phocis, the site of Delphi was said to be determined by Zeus when he tried to find the center of the Earth by sending two eagles flying from the eastern and western extremities. The flight paths of the eagles intersected over Delphi in the myths dating to 510-323 B.C.E. On the back of the card, it reads "Lyrical and dramatic contests were held in the theatre which is near the temple of Apollo. The theatre seated an audience of five thousand. The Phaidriades provide not only a splendid setting but also perfect acoustics, which combines the echo of the Phaidriades with the quiet Pleistos river." In the news, Greece government was talking with other countries from the Euro Zone in Brussels seeking an international bailout.